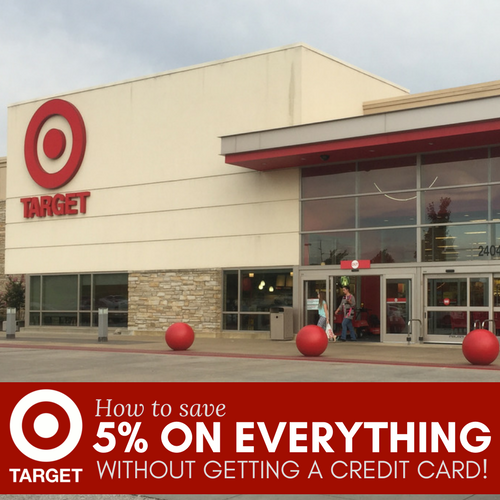 Save 5% on EVERYTHING at Target with Target RedCard! Home / Savings Blog Posts / Extreme Couponing / YAY! $25 off $100 Coupon for NEW Target REDcard Members! Do you have a Target REDcard? If you have thought about getting one, I highly recommend it! With a Redcard, you will Save 5% on EVERYTHING you Buy at Target! On top of your 5% savings, now through 11/3, REDcard members can get a coupon for $25 off $100 or more! It looks like it is for new REDcard members only, so sign up here and get started! This offer is for those who sign up by 11/3, and you will get the coupon mailed to you with your card! The coupon will be valid through 12/9 which is perfect to grab some of your gifts for Christmas! Remember, you don’t have to get one as a credit card! I have a debit card REDcard that links right to my checking! So easy! Get a coupon for $25 off a $100 qualifying purchase when you are approved for a debit or credit REDcard in stores and at Target.com between 10/7–11/3. The coupon will be mailed to approved cardholders with their REDcard and will be valid through December 9, 2018. Excludes alcohol, Apple products, Bose, clinic & pharmacy, dairy milk, DSLR cameras & lenses, Elf on the Shelf, Fitbit, gift cards, Google Home/Mini/Max, GoPro, JBL, LEGO, LG OLED TV, mobile contracts, Nintendo hardware and Switch games, power shave, power dental, prepaid cards, PS4 hardware, Samsung TVs, Sonos, Target Optical, Tile, Traeger, Tylenol pain relief, Vitamix, Weber, and Xbox One hardware. To qualify for coupon discount, the total must not include excluded products. Not only that, they recently announced that they are offering FREE 2-Day Shipping with REDcard! That makes it even BETTER! Plus, be sure to sign up for Target emails.